The job hunt was difficult enough before the recession, and in this economy it can be even harder to find a job when you are trying to change your employment situation. One of the incongruities of the current situation is that it’s actually harder to get a job the longer you have been unemployed. Gaps in your resume can slow your success. If you have the option, work part-time at something, do some freelancing or consulting, or even do some charity work while you search for your job. The important thing is to show that you continue to make progress in your field, and that you aren’t stagnating. Make sure that you prepare for your interviews. When you are actually asked to interview with a potential employer, you want to make a good impression. Prepare by researching the company, dressing professionally, and understanding what you can bring to the company. Your efforts to prepare can mean the difference between getting the job and having to keep pounding the pavement. Your online presence can also improve your job prospects as you search by creating an online profile that highlights your expertise and your ability. A good online profile can help you improve your visibility. 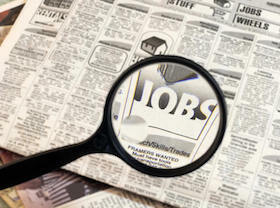 Many employers research potential hires online. If you can show that you provide insights into your career field, and show your professionalism, any employer who does search will see what an asset you can be. Brush up your online networking skills, and you might be connected to potential employers directly. Don’t forget to network in the “real world,” either. Visit job fairs and meet others in your field. You can also attend classes and seminars, and go to other networking events. Use meetup web sites to find others in your field as well so that you can get in contact. You never know when a contact will prove effective during your job hunt. When you have an interview, or even when you submit a resume, follow up. Contact the hiring manager to touch base, and find out the situation. Sometimes, keeping in contact can mean that you are on the top of a potential employer’s mind a few months later when a different position becomes open. If you do have an interview, don’t forget to follow up two or three days afterward to express your thanks and follow up. One of the difficulties of being in this situation is that you have to keep applying for different positions. Hopefully, you have a template cover letter and a template resume that you can tweak for each job you apply for. If you need references, make sure you let them know that you are applying for several jobs. It’s usually helpful to send them information about the positions you apply for. Don’t give up, the more jobs you apply for, the more likely you are to land one at some point. You can get help from your local employment agency, or sign up for temp work, so that you are at least doing some work while you search. Whatever you do, though, continue applying. Could a Career Coach Help You Find a Job? Finally, when you search for a job, be sure that you remain organized. Keep track of where you have applied, and whether or not you have received a response back. Some job hunters I know keep track of when they submitted the application, and also when they followed up on it. This way, you know which jobs you still need to follow up with, and you know which ones you have already followed up with — you don’t want to keep pestering a potential employer. It can also help to keep track of people you have met, jotting down notes about them, so that you are more effective in your networking efforts. As you work toward a job, the important thing to remember is persistence. Keep at it. Refine your resume and elevator pitch, and brush up on your interview skills. And don’t forget to network.